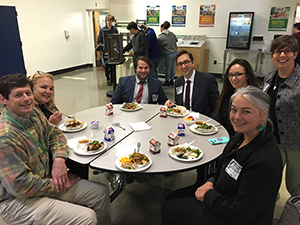 SNA President-elect Doug Davis, SNS, was excited to host U.S. Department of Agriculture Acting Deputy Secretary Brandon Lipps at several schools in Vermont on Wednesday, October 30. 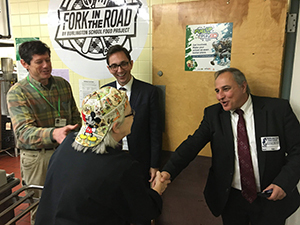 Lipps started off his day with breakfast and an introduction to the grab and go model at Crossett Brook Middle School in Waterbury, where he was joined by SNA Vermont Past President Erika Dolan. He thoroughly enjoyed his time there and was greatly impressed by the meal and the process behind grab and go. 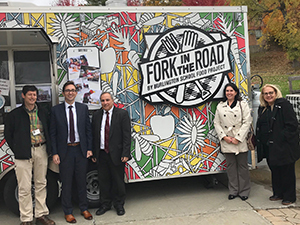 Lipps was then joined by representatives from the Northeast Regional Office (NERO), the Vermont State Agency, and Congressional reps for a high school visit, where he toured the Fork in the Road Food Truck and learned the full story behind its creation and history. Luckily it was farmer delivery day, and Davis was able to showcase local farm-to-school produce: broccoli, swiss chard, carrots, parsnips, cauliflower and butternut squash! 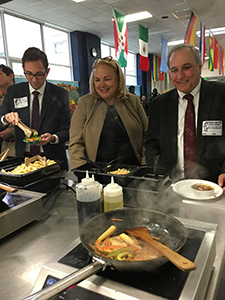 Everyone then enjoyed school lunch from the made-to-order stir fry line and all were appreciative of the available fruits, veggies, and other fresh choices—resulting in clean plates! 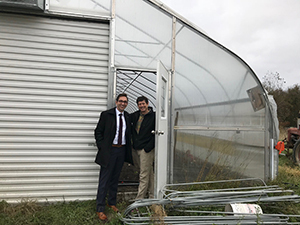 Lipps was also able to visit gardens and orchards at three elementary schools and one of the large partner farms. It was a great day!